The new CW Network series "Roswell, New Mexico" draws parallels to its television predecessor, but 20 years later, the story follows a fresh course in a modern adaptation. Count on more romantic desert panoramas: 2019's "Roswell, New Mexico" TV series is a brand-new adaptation of the alien drama "Roswell" that offers both a distinct voice and plenty of tributes to its predecessor. Melinda Metz's book series "Roswell High" has inspired two television adaptations. The teen drama "Roswell" aired on the WB Network from 1999 to 2002. It is followed 20 years later by "Roswell, New Mexico," a brand-new production that premiered Jan. 15 and airs 9 p.m. ET Tuesday nights on the CW Network. With kitschy delight, both adaptations pay homage to this story by including conspiracy theorists and alien-related food names on a tourist-restaurant menu, such as the "Will Smith" on the 1999 show (referring to the iconic "Men in Black" series of movies) and the 2019 pilot's to-go order called "Men in Blackened Salmon." The waitress outfits of the Crashdown Cafe are back in all their classic glory, featuring alien aprons and antenna headbands. The two programs make distinct interpretations of the core storyline, in which a young human woman named Liz encounters Max, a male-presenting being of extraterrestrial ancestry. A romance emerges between the pair in the books and in both TV adaptations, a situation ripe for plenty of melodrama. Each version of the show explores the theme of loneliness, a condition which carries potentially serious consequences. "About 5 to 10 percent of the population reports feeling lonely frequently or all the time, and an additional 20 to 30 percent report feeling lonely at least sometimes," John Cacioppo, an author and psychology professor at Columbia University in New York, told Space.com's sister site Live Science in 2017. The emotion can make the symptoms of a cold feel worse, and stigma against seeking mental health support can prevent people from getting help. It's no surprise, then, that loneliness is a compelling story arc for diverse audiences. The earlier "Roswell" invokes that theme around relationships: how Max's choices risk social instability for his adopted sister and fellow alien, Isabel, or how Liz and her friend Maria use humor to cope with the secrets they can't tell anyone else. And then there's Michael, the third central alien in the story, whose cantankerous behavior reflects a need to reconcile with his solitary experience in the foster-care system in which he grew up. 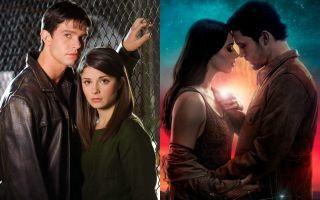 "Roswell, New Mexico" weaves together the same crew of characters with different plotlines, and this adaptation emphasizes the storyline around Liz. The 2019 Liz keeps the Ortecho surname from the book series (which was replaced by Parker in the 1999 show) as the character experiences a new narrative: Coping with her sister's death, she resettles in her hometown, Roswell, to help her undocumented father fend off harassment spurred on by rising waves of xenophobia. And by including undocumented immigration as a central piece to an otherwise fantastical narrative, the creators added a modern and relevant dimension to the revival. There are more-superficial changes, as well. The 1999 alien crew loved splashing hot sauce on everything, even candy, but the sweet and spicy flavor doesn't play a role in the new show's first three episodes. There is one very cool change to catch: High-schooler Liz from the original series dreams of running a biology lab at a university, and adult Liz in the new show has made those bioengineering dreams a reality. Fans of the old show will miss the original cast's synergy — for the most part, the 2019 characters have very different bonds to one another. But the compelling new adaptation will excite long-time series fans about where this story will lead, and will definitely produce emphatic bouts of nostalgia. Watch the newest episode of Roswell tonight (Feb. 5) on CW Network.